Your iPhone can make calls (sort of) and check your email, sure, but new apps are being developed that will allow you to monitor your own health with just your phone. The iPhone is good for more than just playing Angry Birds and making on-the-fly Twitter updates. The device has become a surprisingly popular tool for the medical community–MediBabble, for example, offers a translation tool for doctors dealing with non-native English speakers in the emergency room. But MediBabble just scratches the surface of the iPhone’s medical capacity. Below, check out some of the most futuristic health-related iPhone apps. Researchers are working on a nanosensor “tattoo” that monitors sodium levels (to prevent dehydration in cyclists), glucose levels (for diabetics), and blood oxygen levels (for anemic patients). Designed by a team at Northeastern University, the “tattoo” is attached to a subject by injecting a nanoparticle-containing solution into the skin. According to MIT Technology Review, the nanoparticles fluoresce when exposed to target molecules like glucose and sodium. An iPhone tricked out with a nine-volt battery, a camera filter, and three LEDs tracks the tattoo’s changes in fluorescence and records them. This isn’t an iPhone app as much as an iPhone hack–so far. But it’s only a matter of time before we can use our iPhones to track various substances as they move through our bodies. Worried about that misshapen mole on your arm? MelApp, a $1.99 app, can help tell you if it’s cancerous. 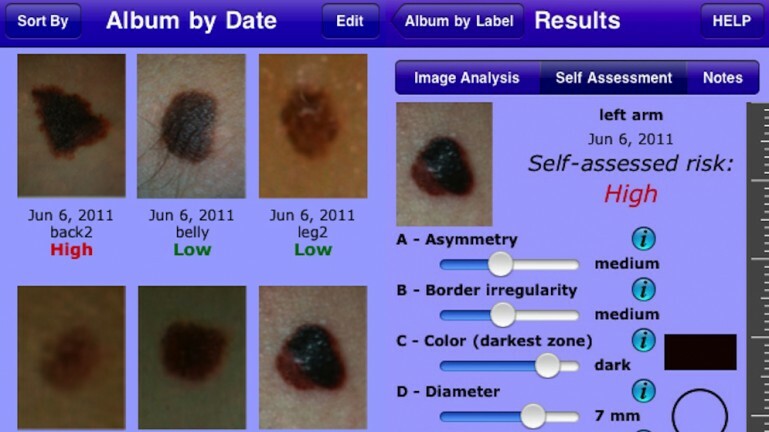 The app, which has been has been validated with an image database from John Hopkins University Medical Center, can spit out a low or high-risk diagnosis for any mole snapped by an iPhone or iPad camera. The diagnosis is based on five factors: asymmetry, border irregularity, color, diameter, and evolution. Constant worriers, commence picture-taking. If the stress of taking pictures of your possibly cancerous moles is taking a toll, Withings has just the fix: a blood pressure monitor (pictured above) that connects to the iPhone. Users simply wrap the monitor’s sleeve around their arm, plug the attached cable into the iPhone, wait for the sleeve to inflate and release pressure, and voila, instant iPhone recordings of your blood pressure and heart rate. Since the app records the time and date of all readings, users can track blood pressure statistics over time (the app displays the info in graphs). It might just save you a trip to the doctor–if you’re willing to shell out $129 for the device. A group of college students recently modified a Samsung Focus smartphone with a microscopic camera lens to quickly and easily detect malaria. The software application, designed for Microsoft’s annual Imagine Cup, analyzes a user-snapped picture of a blood sample to find malaria parasites, detect how much malaria is in the sample, and show the parasites to the user. In the future, the app could be used by health care professionals working in, say, remote areas of Africa where there aren’t any testing facilities. Reuters explains that the team is currently working on patenting and marketing the app–and while it’s only compatible with Windows 7 smartphones for now, we imagine that the iPhone can’t be far behind. The first medical iPhone app to be cleared by the FDA, Mobile MIM allows physicians to clearly view images from CT, MRI, and PET scans on their phones. Thanks to the FDA, doctors are legally allowed to make diagnoses based on the app, which allows users to make annotations and measure regions of interest and distance, among other things. This means that a doctor could remotely make a diagnosis–all the hospital or office has to do is send a copy of the scan to their iPhone.